J: Look at this woman; they’ll show her again. John laughed: That’s you, hon. I published a ST:TOS fanzine! If that means nothing to you, a fanzine is a self-published mag that cannot make any profit in order not to violate a copyright. I printed my fan novel The Race of Cain as a paperback book, instead of a mag, for the fun of it. thank you to my buddy Metlesits Dávid for the cover art. He’s gotten great compliments for it on deviantart.com. I was getting ready to submit the novel to the publisher when I ran into some obstacles. Simon & Schuster don’t take new, unrepresented authors anymore. The current editors print only from their inner circle. The publisher announced that a highly regarded author was releasing a new book — with the same basic plot as mine. So I know this fanzine isn’t going to be a big seller. In fact, I’m the only one who has bought a couple, for me and a couple friends as Christmas gifts. So I have to be happy with the fun of my little fanzine just for me. He’s read 3 chapters of it, and John doesn’t read fiction, so the fact that he even picked it up is something. Remember when Santa riding an electric razor started the season? It was the first Christmas shopping commercial that we saw. I can’t remember if they showed in on Black Friday or later like December 1st with the first Christmas specials, but you didn’t see anything before it and when you saw it, it officially kicked off the season in all our minds! Isn’t it funny – I remember Santa looking different than that. Norelco kept this commerical up — with updates — way into the 90s! So now Santa has been on his Norelco ride! Time for the season to begin! I started decorating today; we used to wait for the first December weekend, but since we’ve started vacationing in Dec., we want to enjoy the decorations before we go. So we started a new tradition of Thanksgiving weekend. Since I’m taking a break from the tree — and trying to find the power strips for the Christmas village — I decorated the blog. I’m making a blog for our vacation; more on that later this week. We’re enjoying a wonderful one at home. We haven’t cooked for years; we’ve either been at someone else’s house or a restaurant, so it’s been great to cook and enjoy the holiday meal at home. I just had pumpkin pie! I’ve been thinking of Thanksgiving as a kid, and for some reason, I think of one when we lived in South Harrison. Specifically, the night before Thanksgiving. Everyone was over, with all the adults in the kitchen doing prep work for the next day and I was watching television. The funny thing is, I actually got in trouble that night (I had a smart mouth. ), but even so, that’s the one that comes back first when I think of that old feeling: being a kid, family, the holiday. I so wish I could go back in my body and relive that feeling. We had a lot of great ones over the year: the time the turkey juiced overflowed the pan and the smoke from the oven made us laugh and crawl along the floor! The one after my Mom’s heart attack. The one we recorded for my brother in the Navy and then sent the tapes to him, so he could live it when he was away from home. The ones John and I have shared alone — where he tucked me on the couch to watch the parade — or the one were we had so many people over… a lot of great memories. I’m thankful for all of them. That we got through another year and have a great trip to look forward to. That Casey has turned 16 and Morgan has now been with us for 13 years. That my family will be together on Saturday and have some laughs. So it’s a great Thanksgiving. I hope you had just as good a day. My friend Joe shaved his head to support his sister. She’s going through chemo for breast cancer. That’s a good man. Has anyone heard of women doing something in support of someone going through chemo? Anyway, Joe’s doing a fantastic thing; shaving his head is just one of them. Good Adoption Day at Petco today! 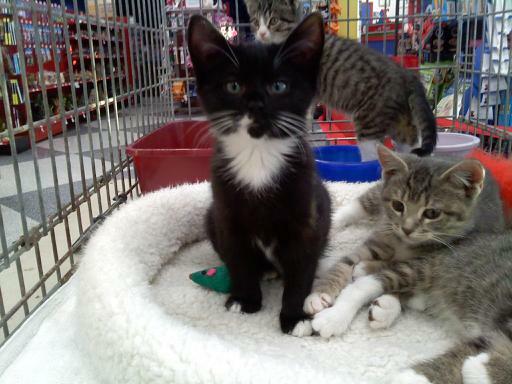 We have applications for 3 kittens! And at least 2 more possibilities. 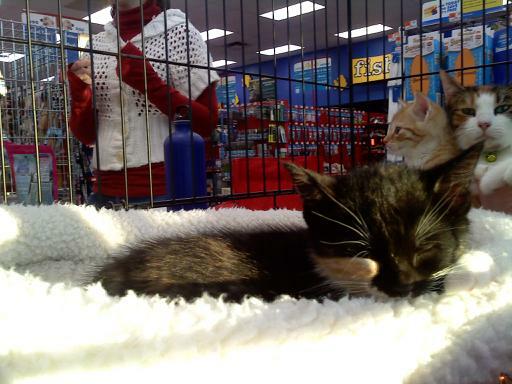 It’s the best Adoption Day I’ve had since I started doing the Deptford Petco event. Every once in a while, you come across a dog or cat that makes you think, “If I was getting….”. Today, I met the kitten for me, if I could get a kitten. At first, I was liking little Jasmine. Look at how cute she is! And purr… she has a purr 3 times her size! She’s playful, but easy going at the same time. I’m so glad my friend Vic is going to adopt her! Then I met little Venture, named for the fact that she’s the first in her family to venture out to checking things out. I first fell for her marking, but then her spirit, friendliness, and heart just made me fall in love with her. If I could adopt her, I would. She’d be Elphie’s play buddy; I can picture them playing together. I’d rename her Emma, after Emma Peel of The Avengers. I think it fits her well. It got to be where I hated people looking to adopt her, like she was mine. But I know that can’t be, so I’d smile and talk about what a great kitten she is. We joked she has that brown spot like a Phantom of the Opera mask, and the hind leg on that same size has that same color, the only paw that does. Her whole family is, and they’re all available for adoption, including her mom, a real sweetie named Callie, short for Caliope. 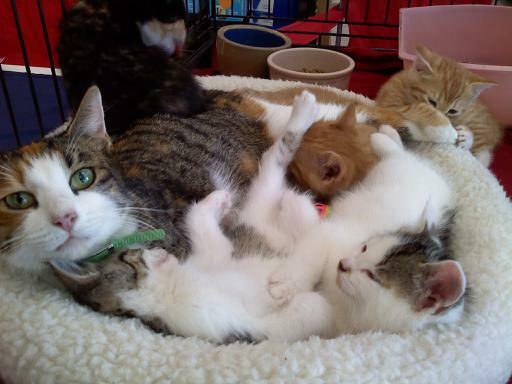 If you’re looking for a kitten or sweetie kitty, check out Venture, Callie, Webster, Quinn, Datsun and Higgins. Or any of our pets at Oasis Animal Shelter that need a home! That link will show you our animals; this link will take you to the Oasis main web site. Disney Mobile Magic now available! Verizon put it on their site yesterday! If you had a problem finding it, look under Apps – Travel. This link will take you directly to the Disney Mobile Magic page. Or text MAGIC to 2777 or look for the app under Travel in your phone’s Media Center – Get new applications. The bad news for me and some others is the list of compatible phones. No smart phones are on it. Hopefully, this will change very soon — like before I leave in 3 weeks 😉 — but in the meanwhile I’ll check out the very nice mobile site.